I had overall 13 positions as of this morning - 2 each of the following: BIDU, RIMM, RIG, CME, GOOG, MA and 1 position of AAPL. Within the first 1.5 hrs of the maret, I was out of all my BIDU, RIMM, RIG, CME, GOOG, and MA positions - all at costs and lot. I gave back all the profits of last week and then soe. My AAPL trade did not get stopped out yet, but I am keeping a tight stop on this in case it reverses. I am still down in my AAPL position from when I got in. 1. All my positions had profits as of last Wednesday anywhere from $50 to $500. But, because I had targets set, these were nowhere near the targets, my indicators as well as chart showed bullish sentiment. I stayed in. 2. Thursday the market took a downturn and some of my stocks did, too, but not all of them. At that point, I believe half had profits still and that would've been a good time to get out of those. 3. My stocks typically do not follow the market real well (in this I mean the S&P), but in this case, it should've been a clue to me when ALL 7 stocks start to follow the market when they typically do not, I should pay real close attention. I kept looking at my indicators for the specific stocks and talked myself into staying. 4. I did another no no of something I did a couple weeks prior, I adjusted and made my stops looser instead of tighter on my bullish positions. How will I ensure in the future this does not happen? 5. Friday, of the 7 stocks, only RIG had a profit and at that point, I should've gotten out of RIG. It was not a big profit, rather just a few hundred dollars, but a profit is a profit no matter how big or small. 6. That would've left me with 1-2 stocks to get out of today, which at opening would've been a good time, but I waited just a little bit (not too long, about 15 min. or so) and got out as after opening up, it began going down. Yes, I know, it's amateur hour, but so what? I was below my stops. 7. It would've been better for me to have tighter, automatic stops because they automatically fill without me rationalizing anything. Rationalizing has cost me many times in the present and past. 8. When the volatility of the market is high, daytrading positions would be better than holding overnight. Yes, you may not have the advantage of gaps, but then, that can also be a disadvantage if it's against you. 9. When market volatility is high, this creates fear and uncertainty. 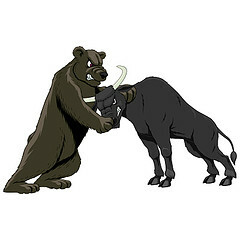 In the same day, like today, it was the bears for the first 2/5ths of the day, then the bulls took over for the next 2/5ths, then ends bearish. This market is not as good for swing trend traders and profits should be taken off the table when they are presented or costs cut very quickly. I did neither and in the end, it cost me quite a bit. As a result of taking 12 costs out of the 12 trades I closed today, I will not be trading Tues or Wed at least. I understand what I did wrong and if I choose to trade this week, it will be very light and daytraded, most likely. In the meantime, I need a little break to clear my mind. I will continue to do backtesting and do trading work, but there will be no funded trades on the table for at least 2 days.